Great solid fire pit. Love supporting local artists. This will last forever! Super clean and a totally different look, this handcrafted 30” elliptical Fire Pit on Flanged base sits approximately 16” off the ground. This fire pit is all hand-welded; it has a re-purposed flanged tank head for a base, the hidden handles are made using re-purposed truck springs, has a 1⁄2” drain hole to keep water out, comes with a free handcrafted 46” Fire Poker, and this fire pit is designed to easily service 2-5 people at any gathering. 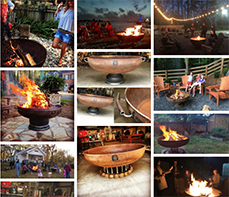 The 30″ Elliptical Fire Pit on Flanged base is a complete re-purposed pit. The bowl like all our bowls comes from the tank industry and the base on this pit does as well. The flanged base is a non pressure tank head and works great in this application not only for stability, but for clean looks as well. Sitting at 16″ finished height it doesn’t over power the party and with it’s inside hidden handles made from re-purposed truck springs you find its easy to tote around. Overall the 30″ Elliptical Fire Pit on Flanged base is made using All American made steel and completely handcrafted here in the USA. It boasts the same thick gauge steel we like to use on all our fire pits also. As we like to say buy local and by American when you can. Don’t let this design fool you; the clean round lines are pleasing to the eye and from a distance your friends and neighbors will mistake it for a super cool sculpture, not until they get up to it will they know its a fire pit. This 30″ Elliptical Fire Pit on Flanged base has a standard ½” drain hole and comes with one of our 46″ handcrafted fire pokers, what’s the fun of a fire if you can’t poke it? It is designed to entertain 2-5 people comfortably or if you want to go up one size check out our 36″ Elliptical Fire Pit on Flanged base. Throw one of our cooking grates on top and whip up a delicious grilled meal for your friends. Better yet, you light the fire and have your friends bring the grub! Don’t forget to get a 30″ Snuffer as well, drop it on the pit before going to bed and instantly suffocate the fire leaving you, your significant other, and your neighbors worry free while sleeping.